Bryan was first introduced to fishing by his parents when he was only 3 years old. By the time he turned 5, his father and uncle gave him his own small pack frame and they set off on many backpack fishing adventures in the High Sierra Mountains of California/Nevada. Bryan was “hooked” and has been an avid fisherman ever since. Just after graduating high school he followed his passion and accepted a job working for the California Department of Fish & Game working in wildlife and fisheries management. While working for Fish & Game, he also worked at various hunting and gun clubs as a guide for upland game and waterfowl hunters of all levels of experience. After guiding and working for Fish & Game for 14 years, Bryan decided to move to the Pinedale area in 2006 with his wife, Katie. 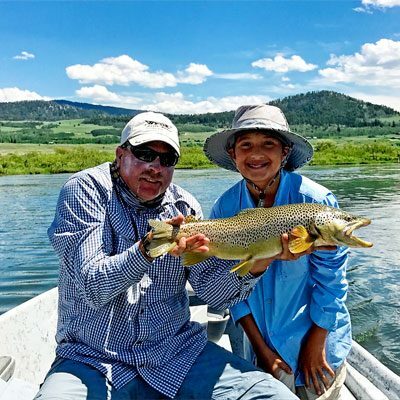 After moving to Wyoming, Bryan continued to guide hunting, fishing, and snowmobiling clients throughout local mountain ranges and waters. During the winter months Bryan is the Maintenance Manager for a local ski resort in Pinedale. Bryan enjoys sharing his passion for the outdoors (hunting, fishing, camping, and boating) with his wife and daughter.